A pair of Kenilworth U1500 trophy hopefuls were winners at Sunday's Westfield Quads. Pat Mazzillo finished 1st in section 5 and Jevon O'Neal, making his rated-event debut, tied for 1st in section 7. NM Mark Kernighan (2200) won the Springfield 10-Minute Tournament on Sunday. He finished with a perfect 7-0 score, 1 point ahead of expert Mauricio Camejo (2026). Unrated Vladimir Ronin took 3rd. FM Steve Stoyko & Ziggy Bliznikas stopped by the Checkmate Chess Club on Sunday & went over their 3rd round game. So, we now have the full score & notes by both players. 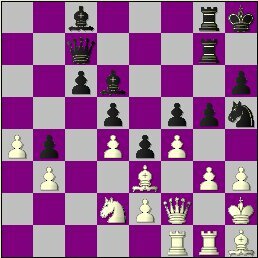 Steve also took the time to explain what the books say about the King's Indian line we played in round 2 & show how I should've played moves 14-19 (14...f5, 15...Ng6 & 19...Rd7) against NM Mark Kernighan. Here' the updated, 3rd round Java-replay page & zipped PGN file. 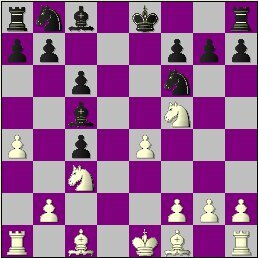 I have annotated 5 games from the KCCC's U1800 section : Mann-Cole (B22), Selling-Renna (C02), Gadgil-Selling (E91), Shiffman-Roach (D02/E60) & Sokolosky-Mann (D07). Hope you enjoy them. They're here.. The set of 3rd round KCCC games that is!... Hot off the e-mail wire, courtesy of TD Geoff McAuliffe. All we're missing is Polese-Massey & the 2nd half of Stoyko-Bliznikas (Need your help, Ziggy!). Here are 85% of Thursday's contests in Java-replay & zipped PGN. 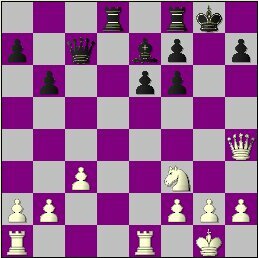 I've posted the notes to my round 3 loss against NM Mark Kernighan & the score from round 1's Renna-Sokolosky. Here is the Java-replay page & zipped PGN file for the former and the replay + PGN for the latter. FM Steve Stoyko (3.0) maintained his lead, with a win over Ziggy Bliznikas. NM Mark Kernighan (2.0) kept pace by beating me (see below) & NM Scott Massey (1.5) did likewise against Tom Polese. The cream is rising to the top of this group but, with two Master vs. Master games on the horizon (Massey-Stoyko & Kernighan-Massey), one of the also-rans could close the 3rd-4th place gap. Greg Tomkovich, Ed Selling, Joe Demetrick & Ted Mann (3.0) stayed in a 4-way deadlock for the U1800 lead & now hold a full point lead over their nearest rival, Mike Wojcio (2.0). Jevon O'Neal became the 15th entry in this section & had a successful debut. - Check out the Open & U1800 cross-tables. Mark Kernighan & Ari Minkov (4.0) are tied for first after week one of the Springfield 10-Minute Tournament. Mauricio Camejo, Vladimir Ronin & Bob Sherry (3.0) are a full point back. The event concludes Sunday (1/28). Tournament Director Geoff McAuliffe sent me several games from Round 2 and we now have the complete set of 9! Kernighan-Polese, which I "Fritzed" for you & all the rest can be found on the updated Java-replay page & in the revised PGN file; along with an improved version of the previously posted Moldovan-Stoyko. Well, I've finally posted the notes to my battle with Steve Stoyko. It was, as my opponent said afterward, "a really interesting game". Hope you all agree. Here's the updated Java-replay page & zipped PGN file for round 2. NM Mark Kernighan moved into 2nd place with a win over new entry Tom Polese (1895). In the U1800 group, Greg Tomkovich, Ed Selling, Joe Demetrick & Ted Mann won to remain tied for 1st. I have annotated the exciting, opening round, Kenilworth Championship game between FM Steve Stoyko & NM Mark Kernighan and updated the previously posted Java-replay page & zipped PGN file. New crosstables for the open & U1800 sections have also been added. These ChessBase-generated versions will have the current standings. I'll try to acquire some more games for you tonight. If my efforts fail, the next post will be on Friday. I’ll have a look at this game, “Fritz” it & perhaps review it with Mark before uploading comments to it. In the only other Open contest, I drew against NM Scott Massey. In U1800 action, Greg Tomkovich, Joe Demetrick, Ted Mann, Mike Wojcio & Ed Selling won while Joe Renna & Bill Sokolosky split a point. I've annotated my game &amp put it in Java-replay + PGN along with the Stoyko and Selling games. 1st round pairings & crosstables. #55 Record 19-Player Field For 2007 KCCC! The worries about a potentially small 2007 Kenilworth Club Championship field were dispelled last night as many late entries swelled the number of hopefuls to a record 19. Headlining the 5-player Open section are 2-time defending titlest FM Steve Stoyko (2310), many-time KCCC winner NM Scott Massey (2220) & last year's runner-up, NM Mark Kernighan (2200). Among those signed for the 14-player Under 1800 section are 2006 Kenilworth Summer Tournament victor Greg Tomkovich (1759), 2006 KCCC U1800 runner-up Ed Selling (1694) & Mike Wojcio (1648). 2006 KCCC U1800 Champ Bob Pelican, expert Michael Goeller & 3-time Kenilworth G/30 winner Ari Minkov are the most notable absentees. The top group will play a double round-robin. The lower group is currently slated as a 13-round all-play-all event but that is subject to change. Play in the 17th 16th Kenilworth Chess Club Championship starts tonight. Last-minute entries will be accepted until around 8:30 p.m. Most members at Kenilworth are undecided about playing in the 2007 Club Championship, which starts next Thursday. Gordon Agress (unrated), Joe Demetrick (1583), Pat Mazzillo (1319), Justin Roach (1708), Bert Shiffman (1434) & I were the only ones to enter last night but, hopefully, the field will fill out & rival last year's & 2005's. For tournament details, see post #47.